Although my daughter has moved out, I keep finding stuff that she left around the house. 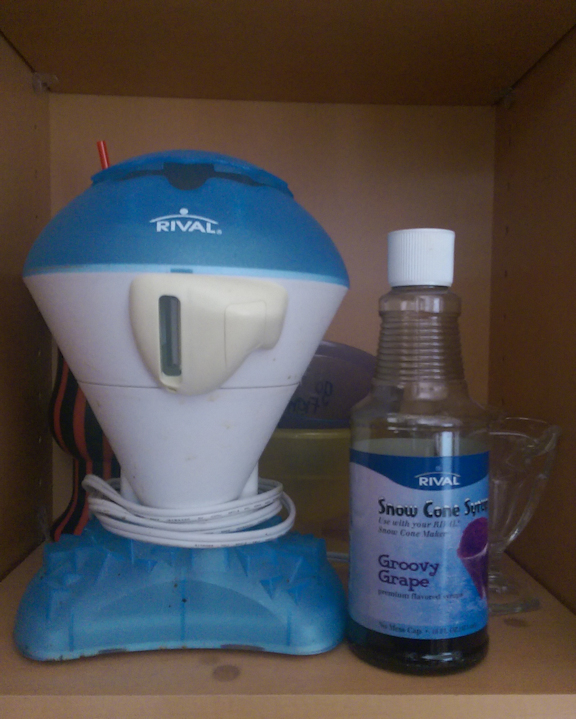 This week’s unwelcome discovery was a Snow Cone Maker on a kitchen shelf, along with cups and a half-empty bottle of grape syrup, which evidently was left on the shelf for years when it should have been refrigerated, yuck. The syrup left purple spots on the shelf; I hadn’t realized because it is above my height and I had to stand on a stepstool to see what was up there. 🙂 I just discovered a low drawer in one of my closets full of our son’s old running shoes and an “ancient” CD player, etc etc. They have been there for years and years…I actually took the courage to throw them all out without asking because he’s never asked for them when visiting probably 50 times since.